When you started your golf game, it was just you. Maybe a friend from work or an in-law every once in a while. Two-seater golf carts were, you know, fine. Now, you’ve got a steady pod of players. Maybe you know that guy. He started coming into your course alone, and now he’s always got a group. Whether you’re the business or the player, you need a bigger golf cart and not just one that folds down seats in the back. There are two different options for you at this point. 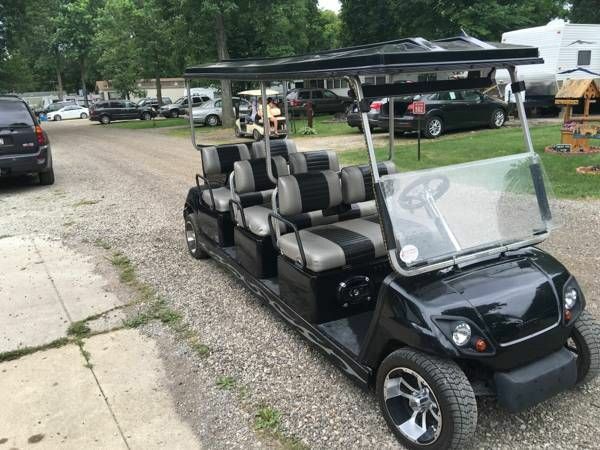 You can buy an entirely new stretch golf cart, or you can modify an existing golf cart. Let’s take a look at what each requires. If you’re buying a brand new (or new to you) custom stretch golf cart, there are a few choices you need to make. Stretch carts come in a few different passenger capacities. The smallest ones add a back row to the vehicle (not the fold down kind in the back) for a four-person capacity. This design leaves you with room for golf bags in the back. The next size up adds two rows in the back for a six-person capacity. You’ll have some room in the very back, but many of your passengers will be carrying their bags with them at this point. Another option is to convert it to a six-seat vehicle with one standard row behind the driver and another fold-down row above the cart’s trunk space. This configuration eliminates the carry space for the golf bags but makes the golf cart body itself more manageable. More extreme lengths take advantage of the same system. Either add the right number of rows behind the driver for a full stretch or add the rows plus the fold down option in the back. You can choose eight or ten seats for most standard stretch golf carts, or request special options for something with even more stretch. Stretching a golf cart adds weight. A standard cart running on electric power might be pretty punchy, but when you start adding on the weight of extra seats, body components, and players plus all their gear, that electric motor suddenly isn’t so punchy. Many companies consider this when they’re making golf cart limos by upping the capacity of the electric motor to handle the weight. Regardless, the more extensive cart isn’t going to handle the same amount of zipping as the standard two-seater. Gas engines are more capable of handling the weight. They’re more powerful overall and are better equipped to handle the extra weight. The downside is they don’t run as clean, and if you plan to use the cart in unventilated areas, gas won’t work. You’re probably thinking of the standard golf cart body for doing this, but there are other options. In some cases, the enclosed body style of carts that look more like cars is also possible. They’re a more refined look for a golf cart. If you plan to use the cart for a business, you might appreciate the elegance of an enclosed body. You can even purchase cold weather kits that are hard doors rather than plastic enclosures. The downside to the enclosed body is the investment is significantly larger. If you want the winter kit, expect to add even more to that investment. What you get in return is a more durable, more luxurious cart. The standard golf cart body is more comfortable to stretch and less of an investment than the enclosed body. It’s familiar, and most people will find it to serve their needs fine. The weather kits for standard frames are often zip plastic covers that protect from moisture but not necessarily the cold. Beach residents, this might not matter to you since cold isn’t much of your thing. Weather-related issues will help make that decision for you. If you have an existing golf cart, you may not need to purchase an entirely new cart. It’s possible to stretch the chassis yourself and breathe new life into that old cart body. You can purchase a kit that requires no welding and just a few tools. Many of the packages are bolt-on systems that work with the existing frame of your golf cart. The EZ GO is one of the easiest golf carts to convert, so many of the kits are compatible with that particular chassis. If you have another type of cart, you need to check the availability of the compatible kits. The kits are not universal. Assuming that any kit will work on your particular cart is going to be a lesson in pure frustration. Just don’t do it. Be sure the check thoroughly what is included in your kit as well. Many come with the platforms for seats, but not cushions, for example. Getting a kit and realizing that you don’t have all the pieces to finish your cart is a frustrating end to what could be a weekend project. Like we said, no welding, but that doesn’t mean you don’t need a few particular tools. Probably the most important is a saw for cutting into the chassis to add the extension kit. You need a saw (and protective gear) for metal cutting. Aside from that, you also need a large drill for extending holes if necessary. Torque tools for adjusting bolts are a must because bolts provide the foundation for the extension kit. Screwdrivers for peripherals such as attaching steering wheel columns are also necessary. If you aren’t sure what tools you’ll need for your particular kit, contact the manufacturer for a checklist. Smaller capacity stretches will be less labor intensive. Some of the kits don’t come with the fold down back seats as a standard and will require an extra investment from the kit. If you’re going all out, you might want to test the integrity of your chassis with a professional unless you are sure of your abilities. If you don’t correctly reinforce the kit, it can cause structural problems as you add weight from people and gear over the long term. You’re Doing a Smaller Stretch. If you’re adding only a second or third row of seats, the chassis stretch isn’t that big of a deal. It’s a few cuts and lining up the bolt holds to expand the chassis. It will take you about a weekend, and you aren’t going to worry as much about the structural integrity of your work. Have you done a lot of work with cars? Built boats? Worked in the commercial building industry? 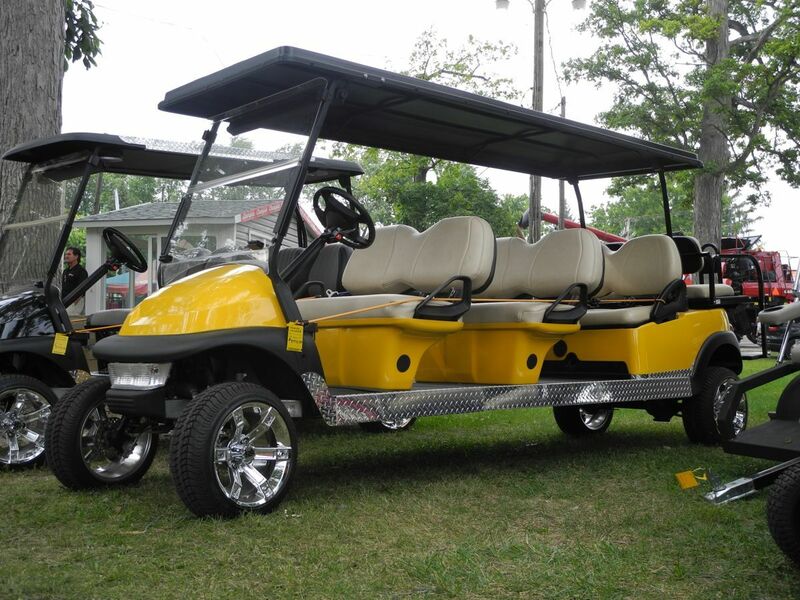 Most DIY golf cart limo kits aren’t going to require any specialized knowledge than a basic history with a few tools. You’ve probably got a fully stocked tool shed and won’t be surprised by any of the requirements for the kit. If you still aren’t sure about whether you have all the stuff for a basic kit, you can watch an installation to get the idea. You don’t need to invest in a brand new cart. If your current cart isn’t getting the job done, you can adjust it for a fraction of the price of buying a new one. Limo golf carts aren’t just about novelty. Sometimes you need the extra space whether for private use on the golf cart or for your business. If you operate a course, your patrons will appreciate the chance to ride around together rather than hauling a bunch of separate carts and cluttering their path. They’re pretty common to purchase made already, and some, especially the stretch kit for the EZ Go golf cart, is simple to put together with just a few basic tools. It gives you satisfaction and bragging rights. You know how to stretch a golf cart now, so picture yourself on the course the first day after the project is complete. How do you want to pull up? Are you in a fully enclosed golf cart with extended seats? Something that drives like a car instead of a golf cart? Or are you casually mentioning that you modified your old golf cart yourself? Basking in the glow of admiration and thoroughly handling the crowd? Whichever daydream becomes your reality, we hope you get miles and miles out of your new stretch golf cart. It’s going to transform your game (or make it more fun at the very least). Are you a DIY-er or in the market to buy a new cart altogether? Let us know in the comments below.